The operators of the CairnGorm Mountain snowsports centre have had to withdraw two of their nine ski tows from service for safety reasons. The Health and Safety Executive issued three improvement notices to CairnGorm Mountain Ltd (CML). Highlands and Islands Enterprise (HIE) took over the running of the centre after CML went into administration. HIE's new operator, Cairngorm Mountain (Scotland) Limited, inherited the improvement notices. As well as the two tows, the centre has been unable to run its funicular railway since October last year. This is due to a structural problem. A report into the issue affecting the funicular is due to be released in the next few weeks. HIE took over the running of CairnGorm Mountain and the funicular railway last month. CML was placed into administration due to "unsustainable cash-flow problems". Its parent company, Natural Retreats, had a 25-year lease to run the site near Aviemore. Staff and other assets have transferred to a new company set up by HIE. HIE already owns the site, but had leased it to an outside operator. It was sold the business and assets of CML by administrators Campbell Dallas. A spokesman from HIE told the BBC that Cairngorm Mountain is "open for business", and is operating a beginners' slope, which is available to everyone. Due to a lack of snow on the mountain no snowsports are offered beyond the beginners' area. 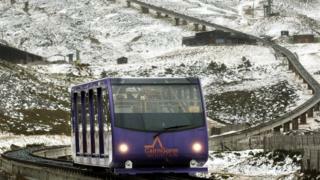 He said: "While the funicular is out of service, uplift on Cairngorm will be limited compared to previous years. "Seven tows are ready to run as soon as conditions allow. "Two tows, the Coire na Ciste T Bar and the West Wall Poma, are currently subject to HSE improvement notices. These notices were issued in December to the previous operating company while it was in administration. Both the affected tows are high up on the mountain and require good levels of snow cover to run. "Our operating company, CMSL, is addressing the issues raised in the notices as a matter of urgency, with the expectation that both tows will reopen on 8 February after HSE inspection."